The J/24 Worlds have been tough… I can’t imagine how frustrating these last two days have been for the competitors and the Race Committee. Yesterday was one of those heartbreaking days on the Chesapeake — juuuuuuust enough wind to reasonably sail a race but a week’s worth of rain flowing down from the north turned the current into a raging monster. Punishment for mistakes was amplified and some really good sailors had some not so good results in the only race of day. Things are looking up for the competitors today and tomorrow with decent breeze forecasted (there’s technically a small craft advisory posted) — the unsettled weather will continue to play a role though, given the radar picture at 11:30am. Shifty, light conditions for Day #3 at the J/24 Worlds. 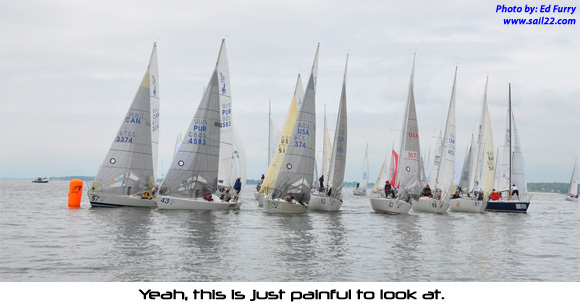 At the start we had 4-6 kts that were pretty consistant and a ripping current that had everyone wanting to to left. We got shut out early and tried to dig to the right with very little luck. We came into the windward mark fairly deep with the entire world stacked up and going painfully slow around the mark and to the offset. An early gybe got us to clean air, decent pressure and the favored side for current. With two consistent downwind legs, we gained back on the boats that we lost by going the wrong way upwind on the first beat. There were a number of wind shifts during the race and the RC worked hard to get in a couple course changes too. Overall, we thought we caught more boats during the race, but I guess a 36 isn’t too horrible when we rounded initially in the 70’s. The leaders going into Day #3 and past World Champs were deep in the fleet and it really opened things up in the standings. Happy to see fellow Annapolitain, Anthony Parker leading the regatta after today. Tomorrows forecast is looking better with more breeze, a bit warmer and hopefully some sun. It’s a whole new race after today and RC will push for as many races as they can. I accept the challenge… Bring it on!